Mrs. Dino is outside hunting for her son Owen who is supposed to be doing his home work. 'Where are you Owen?' Mrs. Dino looks everywhere - in the house and in the garden making sure she checks behind all the bushes. But she can't find Owen anywhere because he is hiding up a tree. He he - naughty Owen! ... and Mrs. Dino sits outside by her favorite lavender bush to do some knitting. 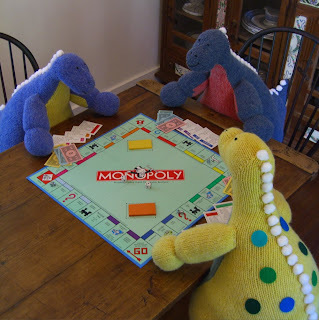 The Dino Family love nothing else but to end their day doing one thing - and that is to play a game of Monopoly together. Mr. Dino is sporting a rather crafty smile - do you think he could be cheating?? Rachael - these are truly delightful! Gosh you have such a talent for giving your creatures wonderful expression and animation! I especially love Mrs. Dinosaur's spottiness and Dinosaur son's shapely foot pads. Lovely, lovely, lovely! 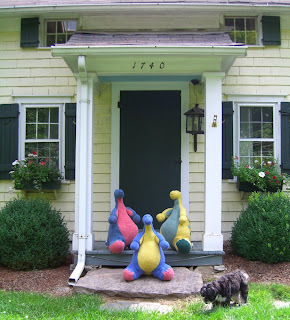 Love all their creative pursuits - piano, poetry, knitting - they are too cute! These are FAAAAANTASTIC!!!!! How much stuffing did that take bunny girl!???? so much fun going on in your neck of the woods. great dinos. wonderful! I adore your dino family! Those dinos are fantastic! And huge! 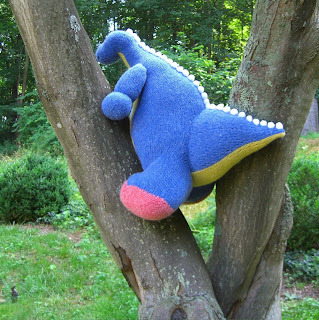 I love seeing pictures of plush creatures doing people things. Great job on the photos. I think my favourite is the Monopoly game. Rachael, what can I say.Once again you've brought a chuckle to the surface with the antics of your motely crew! Love the Dino family. They look much more functional than mine. You always put such thought and imagination into your posts, I love them , love the Dino family too, they must have taken a while to do? What well educated dino's, Yeats! They are totlly adorable. What a cultured lot of dinos you have there. None of this trashy junk at your place. Great to see a "real" family. Oh wow, I love them! They have got to be the cutest dinos I've ever seen. And so sophisticated too! They are wonderful! 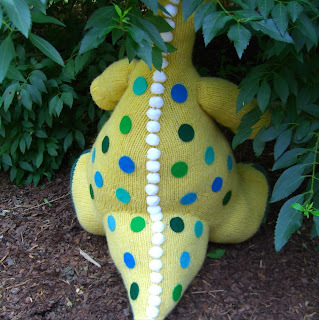 I love Mrs. Dino's spots. What cultured dinos! The dinos look HUGE!!! Well they would do wouldn't they because they are dinosaurs. They look superb. So much attention to detail, lovely faces and so much character too! 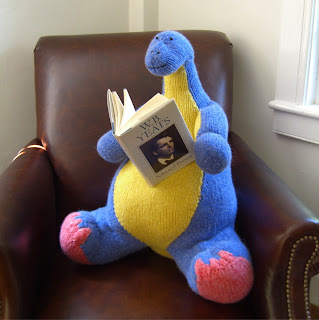 Lovely big dinosaurs - they're very well read and well bred. Outdoor crafting too I see - fantastic. 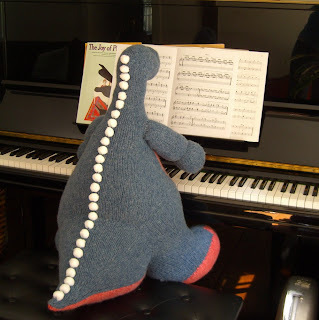 The dinos are so lovely, and I especially love that when they play piano, its 'dinovorak'! They are too cute. What a happy little family, and so cultural too. What?!?! Oh my. Cute doesn't even begin to describe the fabulousness of these dinos. Very happy looking dinosaurs there - great post. LOVE these fellas!!!! They are amazing and so big and full of personality - they make me think of one of the dinos on Harry and his bucket full of dinosaurs. 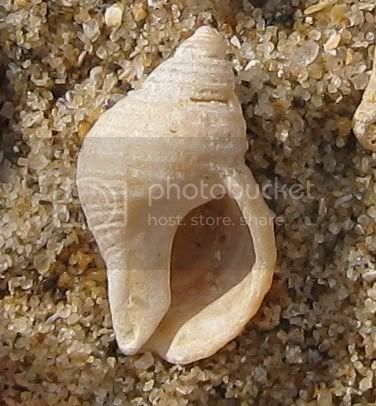 You are so clever!!! aww I love those dino's they are so gorgeous!!! I want to know bought Fleet Street! Too lovely Rachael you are so very clever! What a load of fun, just the other night we watched the Flinstones movie, again and I thought of Dino and your Dino's - such for for dinosours. 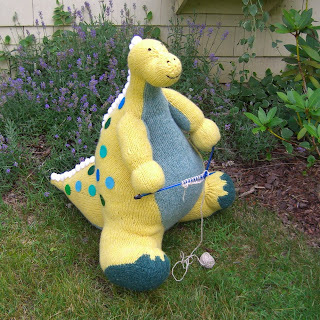 I wish I could be in the garden knitting like Mama Dino right now. P.S. I'm having a little giveaway over at my blog, so stop by and play along if you'd like! I LOVE THE DINO FAMILY! I can't believe they're so big, how long did they take you? Heavens Rachel, they are HUGE!!!!! Just right for little ones to cuddle and fall asleep on. I think Mr Dino has had one paw too many in the banker's cash till! I think I have fallen in love with those dinosaurs. You are one very clever lady. 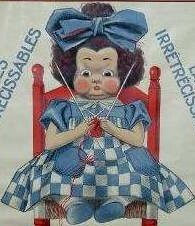 Just wondering if this pattern is for sale? I am making a baby shower gift and loooove these guys!